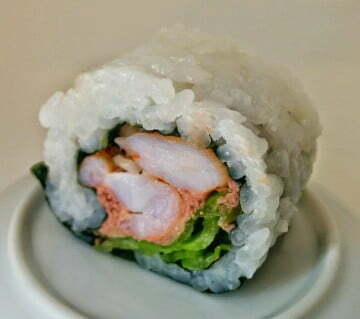 "This unique roll is simple enough to make, contains no raw fish - and creates a very fresh taste. You'd be surprised how well this simple combination goes." PLS is a very basic and simple recipe. The ingredients are easy to come across and are not too expensive. You can probably find most of what you’ll in your local supermarket. You can make different variations of it and experiment with the quantities or try substitutions and additions. 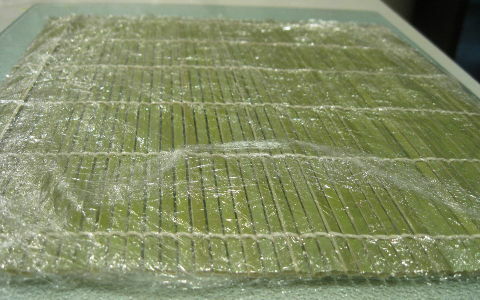 Take a nori sheet, and break it in half. If it doesn’t break easily, you can toast it for a few seconds or use scissors to cut it. Place one half on the mat, with the rough side facing up. 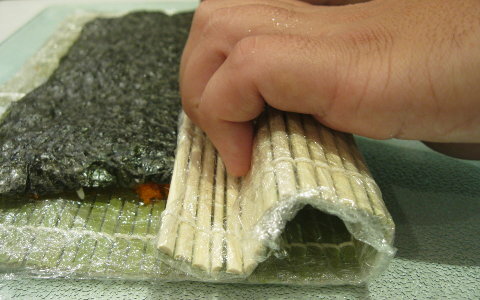 In this example I actually used the entire nori sheet to get a larger roll, but half a nori should be enough. 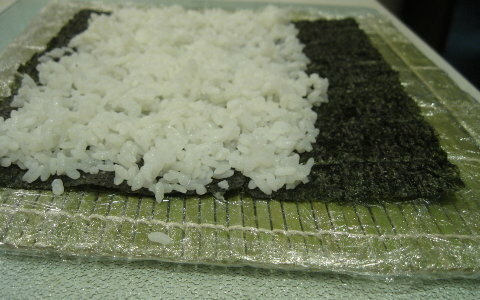 Grab a handful of prepared sushi rice, and spread it gently over the nori – about 1 cm high. 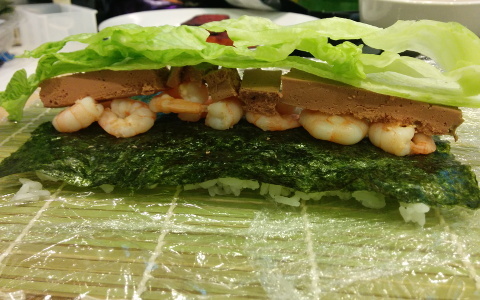 There’s no need to press the rice down onto the nori, only spread it to cover the sheet. 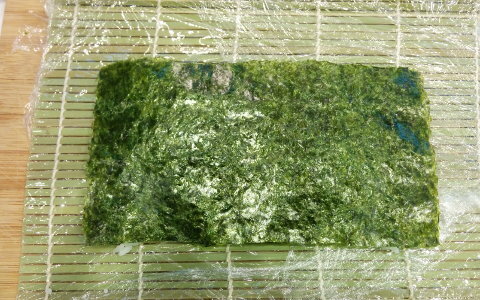 Cover the entire sheet if you are using half a nori, and the about 80% of it if you are using a full nori. Flip the nori so that the rice is now facing down. 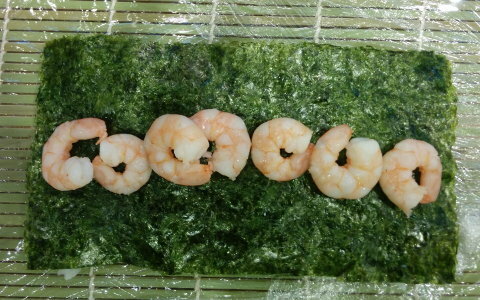 Line the shrimp along the center of the nori. Try the spread it as even of possible so there is as little overlap and no spaces in between shrimp. It might help to cut the shrimp into 2-3 pieces, I chose however to leave it whole. 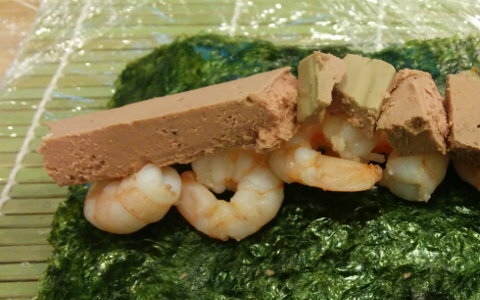 Cut long and thick rows of chicken liver pate and place on top of the shrimp, again covering the whole length with as little overlap as possible. In my case you can see the pate broke. That’s okay since it will all mush together when rolled. Place a few cuts of lettuce on top. You can see I used 3. The more lettuce you use, the more crunchy and fresh the roll will be. Try however not to overcrowd the roll to keep it easy enough to close. Roll it inside out. 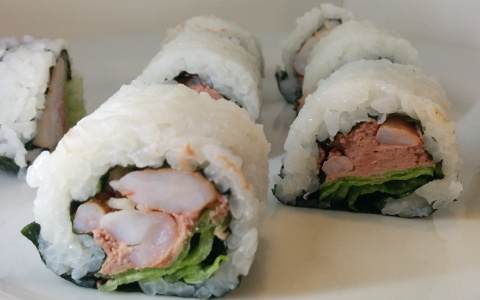 You can find detailed instructions on how to roll inside out sushi here. Cut into 8 equal pieces. For best results first cut in half, then cut each half into two, and then again. Plate it in any formation you choose. You can be very creative in the way you final touch the dish, for example a tiny drop of thick Teriyaki sauce on top of each sushi piece would do very nicely. Best served with soy sauces, pickled ginger (gari) and wasabi.